Last week we revealed that Dr. Jegasothy has been nominated for multiple Aesthetic Everything Awards! We appreciate everyone who has taken the time to vote since we announced it. However, the race isn’t over yet! Voting for the Aesthetic Everything Awards officially ends October 1st. To vote for us, click either the categories on the image or click the following links and enter your email. It really is that easy! Rest assured that your email will not be used for marketing purposes. 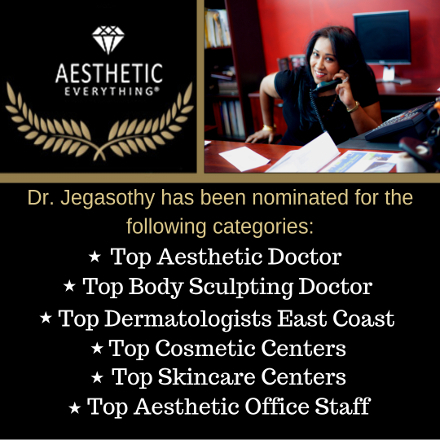 ← Dr. Jegasothy nominated for multiple Aesthetic Everything Awards!